Peaked T waves are taller than normal and sharp with a narrow base. They are classically associated with hyperkalaemia. Electrolyte disorders are common and can be very dangerous. Potassium is one of the most important electrolytes in the body. Most potassium is intracellular and the small amounts of extracellular potassium are usually tightly regulated. Disorders of potassium can lead to critical arrhythmias if not detected rapidly. Hyperkalemia (high potassium) makes the heart less excitable. Classic signs of hyperkalemia include tall, peaked T waves. It may also cause a widened QRS, prolonged PR interval and loss of the P waves. If you think of the ECG trace as a length of string, it is a bit like someone is 'pulling up' on the T waves, dragging everything towards the T wave. Do the ECG signs correlate to the serum K? Hyperkalemia can cause so many different ECG changes that Dr Amal Mattu refers to it as the "syphilis of electrocardiography".ref In particular, hyperkalemia can cause dramatic ST segment changes so that it mimics a STEMI.ref It is also possible to have both hyperkalemia and an acute infarct! You should be on the lookout for hyperkalemia in patients with renal failure, potassium supplements, potassium-sparing diuretics, ACE inhibitors, or any patient with a new bradycardia or AV block.ref Constant vigilance is required! What's the difference between peaked and hyperacute T waves? Peaked T waves have a sharp point and a narrow base. Hyperacute T waves have a broader base and are 'fatter' so that there is more area under the curve. This ECG is from a man in his 60s who presented with fever and delirium. He has a history of renal failure, T2DM and cognitive impairment. This ECG shows accelerated idioventricular rhythm with peaked T waves due to hyperkalemia. A patient with cardiac arrest, ROSC, and right bundle branch block (RBBB). This ECG is from a patient who presented after a PEA arrest with ROSC after intubation and chest compressions. This ECG shows irregular, slow, wide complex rhythm with peaked T waves due to hyperkalemia. 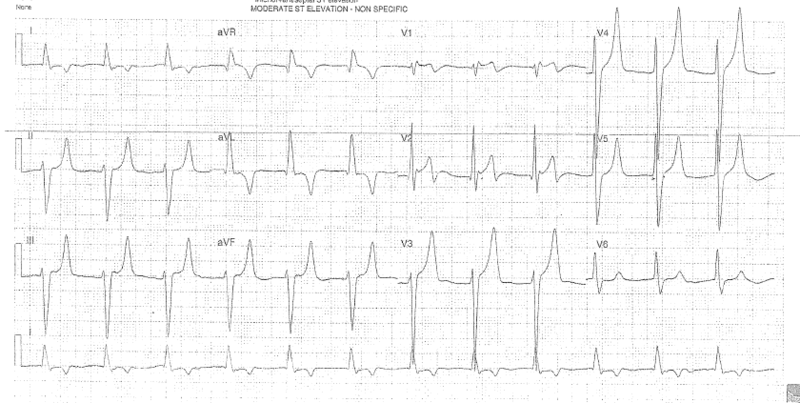 What will you do for this altered and bradycardic patient? This ECG is from a woman in her 60s who presented from a nursing home with altered mental status, hypotension, hypoxia and bradycardia. This ECG shows an irregular rhythm due to second degree AV block with wide QRS and peaked T waves. The cause was hyperkalemia. This ECG is from a middle aged patient who presented with chest pain of uncertain duration. This ECG shows ST elevation in V1 only. This was dynamic on serial ECGs. The cause was a proximal RCA occlusion. The T waves were peaked but the potassium was normal. This ECG shows ST elevation in V1 has resolved. This was dynamic on serial ECGs. The cause was a proximal RCA occlusion. The T waves were peaked but the potassium was normal. This ECG is from a middle aged patient who presented with chest pain of uncertain duration. This was the repeat ECG when pain returned. This ECG shows ST elevation in V1, II, III and aVF with reciprocal ST depression in aVL. The cause was a proximal RCA occlusion. The T waves were peaked but the potassium was normal. This ECG is from a woman of unknown age who presented with a clotted dialysis shunt. This ECG shows peaked T waves and flattened ST segments caused by hyperkalemia. This ECG is from a patient on dialysis who presented after a fall. This ECG shows flattened ST segments and peaked T waves due to hyperkalemia. This ECG is from a patient with a history of diabetes who was found with a GCS of 4. This ECG shows sinus rhythm with peaked T waves that were so narrow they were mistaken for separate QRS complexes. The cause was hyperkalemia due to acute renal failure. Could you have prevented this young man’s cardiac arrest? This ECG is from a young man who was found at the bottom of his basement stairs. He complained of right hip or leg pain but seemed confused about what had happened. He had a history of IV heroin abuse. Shortly after he had a wide complex PEA arrest and had a ROSC after 20 min of resuscitation with epinephrine, glucose, calcium and bicarb. This was his triage ECG before he arrested. This is a library of 2321 free, open access, re-usable ECGs from across the web.